The Chicago International Produce Market on a rainy summer morning. 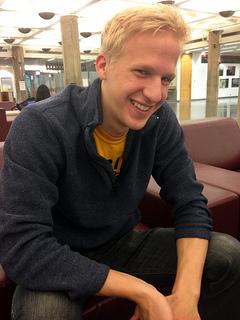 Teddy Kent recently graduated from the University of Chicago with a degree in Public Policy. 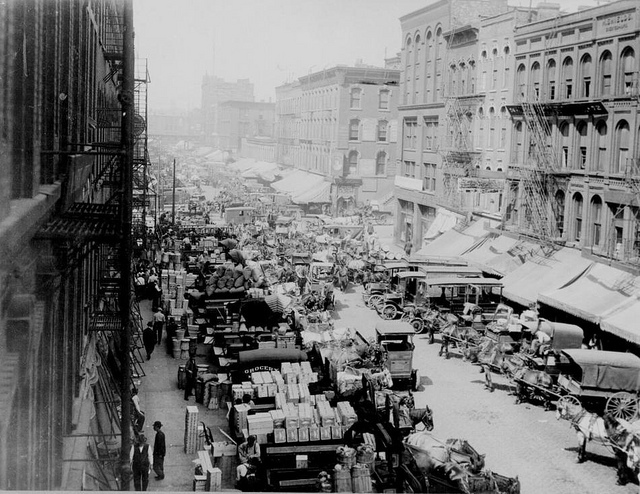 Looking west on South Water Street, Chicago, crowded with horse-drawn wagons and motor trucks filled with produce for market, April 1915. The old produce market, above, and the condos that have replaced it, below. Although most produce vendors at the market have temperature-controlled ripening rooms, Atom Banana has some of the most advanced, state-of-the-art banana ripening technology in the industry. 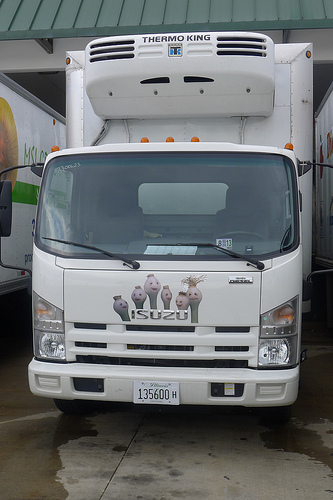 Happy scallions on a truck -- what's not to love? It was a mystery to all of us, and we’re guessing to many Chicagoans, too. So allow us to peel back the history and take you to some corners of the city rarely seen. We started with the routes fruits and veggies take in traveling from far-flung soils to the city’s market shelves and farmer’s market stalls. To break us into the business, we spoke with Tim Fleming Sr. Not only has he been involved in the Chicago produce business since 1965 and worked at the local, state, national, and international levels, he helped develop the Chicago International Produce Market in the late 1990s. Fleming said the Midwest’s prime growing season is only three months long, so in order to keep the peaches and pears and popular produce on the shelves year-round, we import from around the world. 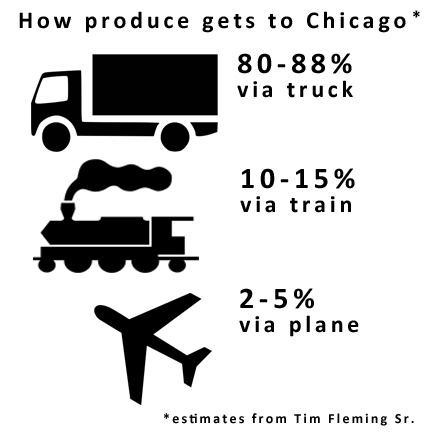 So once the planes, trains and trucks have entered Chicago, there are a few ways the produce gets divvied up. For this we spoke with Peter Testa of Testa Produce, a major wholesale distributor who mostly supplies restaurants, hotels, hospitals and corporate dining (e.g., big companies with cafeterias and university dining halls). Today, Chicago’s Loop would seem an odd place to stick a giant, dirty, noisy produce market, but in the city’s early days, that’s where people expected fresh produce to be. But, as with much of the architecture and layout of Chicago, the Great Chicago Fire of 1871 changed the course of history – including the location of produce in the city. Following the conflagration, the city’s business district move southward and away from the river. The new location along South Water Street (today’s Wacker Drive) attracted wholesalers with their horse-drawn carts, as well as peddlers with smaller handcarts. The idea of this jam-packed and bustling area in central Chicago –– full of horses, pears, and Polish produce peddlers –– made us imagine the sounds, sights (and yes, smells) that would have assaulted shoppers’ senses. Around the turn of the last century, city planners and adherents to the City Beautiful Movement felt the market setup was offensive, disorganized, and outdated. A key part of these reformers’ plans to transform the “Old City” was to move the smelly, loud produce market out of downtown Chicago. 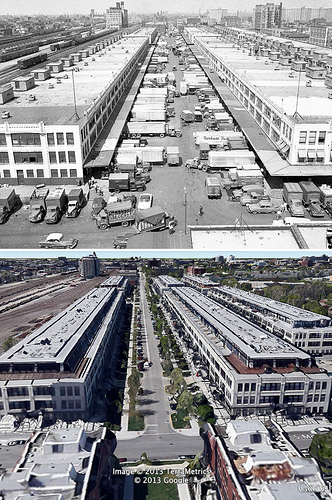 So in 1925 the market migrated to a large facility at the corner of South Racine Avenue and 14th Place (retaining its South Water name), a spot distant from the Loop but still fairly accessible to Chicago’s railways — an important consideration, given that rail was the most common way of moving produce. Eventually, even the new South Water market was deemed disorganized and outdated. We learned this first-hand from the folks at the current Chicago International Produce Market. Several people we spoke with described the chaotic situation of the old South Water market, which involved storing and transporting produce in four stories of warehouses, loading and unloading trucks on docks that had been built for horses and carts, dodging rivers of rats, and contending with cramped and chaotic traffic. Although produce was shipped to Chicago by rail, it was rarely unloaded at the South Water Market directly from trains. Instead, small trucks moved the produce into the market from off-site warehouses where it would be resold when the market opened. Also, many larger trucks were forced to offload produce onto smaller trucks before getting anything into the market. Produce companies continued to use that Racine facility until 2001, when the market moved once again. The upgraded facility was named The Chicago International Produce Market, and opened at the corner of Blue Island and Damen, just a mile and a half from its previous location. The CIPM is the largest market in the city (and third largest in the country, according to Fleming), splaying across 33 acres that sit between Chicago’s Pilsen and Little Village neighborhoods. 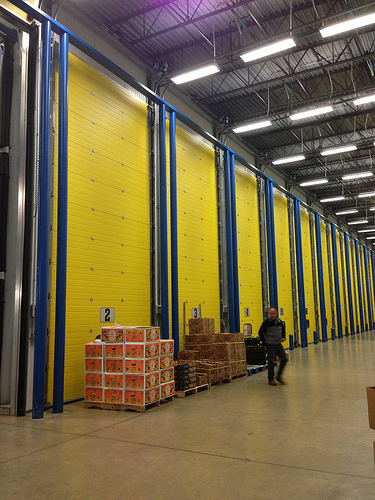 The 450,000 square foot warehouse facility is a few city blocks’ worth of utilitarian, non-descript, loading, unloading and storage space. And before the sun rises over Lake Michigan each morning, rainbow streams of bright, fresh fruits and vegetables are sorted and sold, then loaded into boxes, placed onto trucks and hauled to grocery stores across the city and to stores hundreds of miles beyond. You can spot brown road signs pointing the way to the CIPM if you’re in the neighborhood, but you should know those directions are for truck drivers and licensed buyers, not regular folks; this market is wholesale-only and not open to the general public. The new setup rests on a single floor, but includes more space overall. It was also built to accommodate trucks and truck traffic. Inside, the businesses have similar layouts, with counters and displays in front, temperature-controlled coolers in the back, and then loading docks. That Chicago still has a centralized produce market with dozens of vendors may come as a surprise to some, considering the widespread changes to transportation and the way that people shop. The facilities may be newer, the truck traffic a little less crowded, and the scale a little smaller, but most of the elements — especially the way that wholesale vendors do business — remain the same as when the market operated fifty or even a hundred years ago. Prices are negotiated by growers and shippers and wholesale buyers, and eventually also by the customers of the market, too. Kohout says the produce business has always operated on trust: trust that you’re getting a good product from the grower and trust from the end buyer that you’re giving them a fair price. Produce that arrives in Chicago encounters the market’s simple setup. Two warehouse buildings that stretch for nearly three blocks house twenty merchants who own wider or narrower sections of the warehouse in an arrangement that’s similar to a condo association. Trucks pull up to the back of a wholesale unit, where pallets topped with crates of fruits and vegetables are unloaded with small, fast electric forklifts called power jacks. Produce is organized into designated warehouse rooms calibrated to different temperatures for specific fruits or vegetables. This is necessary because different fruits emit different amounts of ethylene gas, which accelerates the ripening process. In fact, there’s a good chance that the yellow bananas and green bananas at the grocery store arrived in Chicago at the same time. Companies like Atom Banana use ripening rooms to control temperature, humidity, gassing, and ventilation, which all affect the ripeness of a banana. Even less exotic fruit, such as apples and pears, are subject to these ripening tactics. On the other side of the market, when the fruit is ready for delivery, trucks pull up and are loaded up with power jacks. The loading dock turns into a fruit-lined highway, with power jacks honking and zooming by. The trucks at the Chicago International Produce Market will head to smaller produce distributors that sell to restaurants, or to independent produce markets; Jewel and Dominick’s, like most larger market chains, have their own supply warehouses. Most produce brought in is not pre-ordered, so wholesalers basically gamble on what to order, how much to order, and how much to charge for it. In spite of droughts, traffic jams, and competitive business, a diverse group of wholesale vendors provides the city with its fruits and vegetables. It’s a much-needed hub for food, vitamins and minerals for a city whose produce hustlers wake up as early as 12:30 or 1:00 am, so that they have the time to deliver for Chicago.